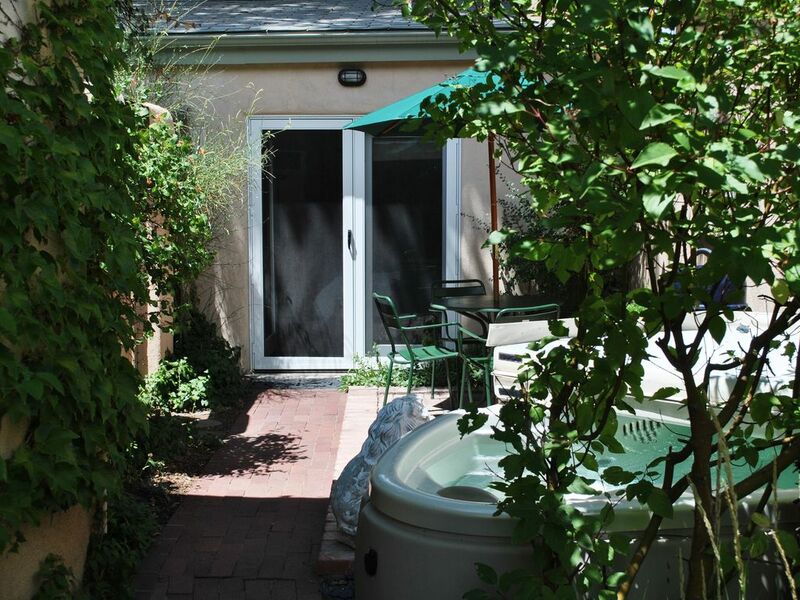 Fabulous Downtown Guesthouse in Historic District, Hot tub! Perfect Location! Romantic, exquisite and only two blocks from Santa Fe Plaza! Tucked away in an historic downtown Santa Fe neighborhood is McKenzie House. Relax and enjoy Santa Fe at its finest. Just steps away from the Plaza and major attractions including the Georgia O'Keeffe Museum (one block away! ), Spanish Market, Indian Market and other world-class events, you can treat yourself in downtown Santa Fe. This very special, newly remodeled and private guesthouse is located in the heart of the historic district. We are the closest residential home north of the Plaza! Better than a hotel and more space than a B and B, you have your own fully equipped 'casita' (little house) and central location to enjoy the many sights and activities of Santa Fe and Northern New Mexico. Our comfortable and luxuriously relaxing casita is freestanding and separate from our main home; both sanctioned historically significant structures by the City of Santa Fe. Our main home was built circa 1915, the casita was the original carriage house. Experience the excitement and charm of Santa Fe in the comforts of your own private neighborhood. Dine at your leisure in your contemporary kitchen or the numerous world class restaurants within easy walking distance, relax by the kiva fireplace or in your private outdoor hot tub and patio, and stroll to the many sights and adventures of the Santa Fe Plaza. Museums, galleries and events are just outside your door. In Santa Fe for business? The Eldorado Hotel is one block to the south, and most other centrally located hotels are close by. Why stay at a hotel when you can be within a short walk to your own fully equipped casita? Take a short drive up the mountain to the Santa Fe ski area and magnificent hiking. Perfect for the many activities that happen downtown, such as the Chamber Music Festival, Spanish Market, Indian Market (also just two blocks away), Fiestas, etc. The new Santa Fe Community Convention Center is one short block away. Private parking, locking front gate and a beautiful southwestern garden are yours! So come, stay and relax. We have equipped our casita with all the amenities that will make your stay with us as pleasant as possible: a romantic kiva fireplace, direct dial phone that lets you stay in touch with the outside world, air conditioning and. An adjustable ceiling fan for a cool breeze, big fluffy towels for your hot tub and shower, and specialty soaps and shampoos to pamper you. Comfortable bathrobes and a hairdryer are furnished so you can leave yours at home. Cable television will bring the world to you on a state of the art Panasonic 15.2' LCD flat panel screen with DVD for movies (many provided), as well as wireless internet access- if you decide to bring it with you. The artwork in the casita is like living in your own private Santa Fe gallery! I have lived in New Mexico since 1989, initially to attend graduate school at the University of New Mexico. I soon discovered Santa Fe and purchased this gorgeous downtown home in 1997. The guesthouse was remodeled in 2001-02 as a vacation rental, and I continue to add and improve to it on a yearly basis. It is truly a labor of love that I enjoy sharing with guests. I am a museum professional and work with institutions throughout the world. I also actively play tennis, hike area trails and travel whenever it presents itself. My beautiful westie, Stella, will joyfully greet you when you arrive. My goal when purcashing a home in Santa Fe was to be downtown and include a guesthouse. It miraculously presented itself, and I have enjoyed making it the comfortable abode it has become. Location, location location! PLUS privacy, security and many creature comforts. Glass shower, Grohe faucets, travertine tile throughout. Golf: BR B Amenities: /B BR Private Jacuzzi hot tub on a beautiful and private deck, hearty and healthy breakfast basket in your contemporary kitchen, spa designed bath with walk in glass shower and plush towels, specialty bath products and hair dryer, full kitchen including microwave, dishwasher, disposal, granite counter tops, professional range, brand new queen-size bed with designer organic linens, down comforter and fluffy pillows, gas kiva fireplace in the living/sleeping area, washer/dryer combination in bath,15. Ski: ' flat panel screen with built-in DVD; basic cable; some DVDs provided, cordless private telephone line with local access and answering machine, many books and guides about Santa Fe and surrounding areas, adjustable ceiling fan above the bed, additional phone line hook up for computer modem, WIRELESS internet access available, off street parking in private driveway, Sony CD stereo with IPOD dock, CD library, bathrobes and slippers, skylights, traditional and contemporary fine art by Southwest artists in the casita (and for sale! ), maid service available upon request. BR B Activities: /B BR Downtown Plaza, great shopping, Indian Ruins, Hiking, Biking, Golf, Tennis, Massage, Fitness Center, Gym, Wildlife Viewing, Horseback Riding, Shopping, Restaurants, Live Theater, Cinemas, Rafting, Downhill Skiing just a 15 minute drive up the mountain, Cross Country Skiing, Sledding, Ten Thousand Waves & Other Health Spas.